This has been a big week for my company. We were acquired by a large company and great things are coming. On the day we found out, not only did we have that excitement but, we also had a client visiting. And, lucky for me, I got to take him to lunch. After debating on where we would go, and knowing only that we were avoiding seafood, I suggested Bokampers. Bokampers is literally minutes from my home yet, I have only visited on a few occasions. I have found the food to be good but, if I am looking for a sports bar atmosphere, I much prefer Ale House. But, Bokampers is a bit nicer and closer to the office so, we opted for that. Not only did I get to share a good meal but, I also found out just what an Engineering Ring is. After browsing the menu, I selected the Grilled Chicken Salad with no tortilla strips and dressing on the side. 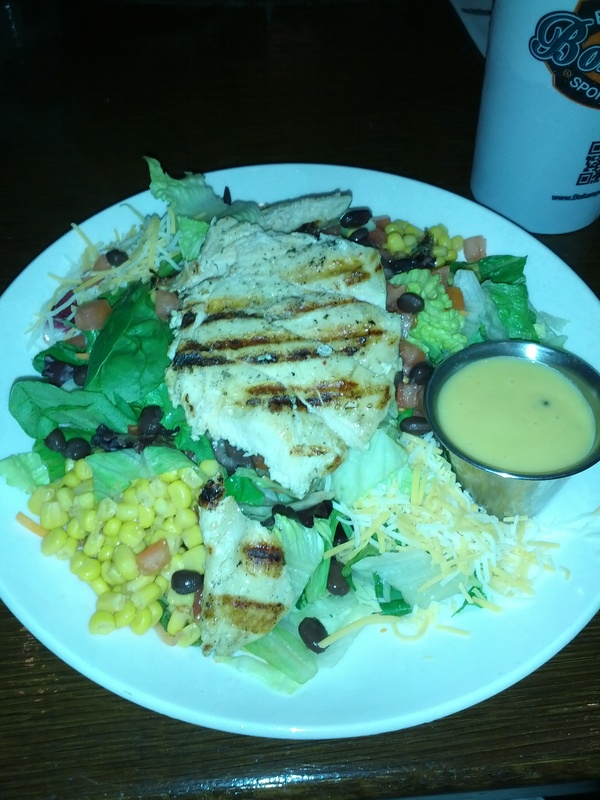 The grilled chicken is served on a bed of mixed greens and is topped with corn, black beans, tomatoes and cheese. I did find the menu to be a little overwhelming but, that could just be me. For lunch, I like to keep it light. I will say that the Unsweet Iced Tea on this particular day, was not good. Not good at all. I drank it but, I really did not enjoy it. When our food arrived, the salad looked great and I was ready to dig in. By far, the star of this salad was the Grilled Chicken. This was an amazing piece of chicken. It tasted as if it has literally just come off the grill. The flavor was exceptional and the chicken was juicy & moist. I found the flavor to be great throughout. I enjoyed eating the chicken just alone and separate of the salad. It was served warm but, neither hot nor cold…a good temperature in my opinion. As for the salad, the greens were very good – fresh & plenty. I found that there was a bit too much corn on the salad and not nearly as many black beans. The tomatoes and cheese were both fine – neither really stood out to me. I had honey mustard dressing on the side and I ate a few bites of this…it was good and not overly sweet. Overall, I enjoyed my Grilled Chicken Salad. As I said, the piece of grilled chicken was simply killer. I would eat this over and over again. Now, I probably won’t be running back to Bokampers any time soon but, if I had to eat there again, I would order this without a doubt in my mind. We had a good meal, good service & I got to enjoy good company. Bokampers is a good lunch location and I would certainly bring a client there for lunch again. And, since I know you are all dying to know – all Engineers in Canada receive an Engineering Ring…part of a big ritual. How awesome is that?